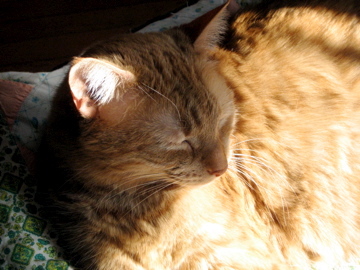 Inspired by Gillian, who blogs about her cat SheBang every Friday. And really, how could you not be inspired by a redheaded Canadian geek-girl named Gillian, who loves cats? The similarities are eerie. I wonder if her mom was ever a nun. Your mom was once a nun! Gillian your family is the only family that I have ever granted this award: "more interesting than mine". That is a very cute cat. She looks so warm and happy. Don't say I'm a redhead, it'll just get my boyfriend excited (all I've got are some strawberry-blond highlights in mousy brown hair). And Mom wasn't a nun, but she was a librarian. Is that similar?